If the storage allocated to store backup data is full and if there is no provision to add more storage, it is almost impossible to continue with the further backups and the backup jobs will start to getting failed. The storage repository management of a Vembu BDR server has a hybrid volume manager that flexibly supports scaling of the storage repositories as per the storage needs. 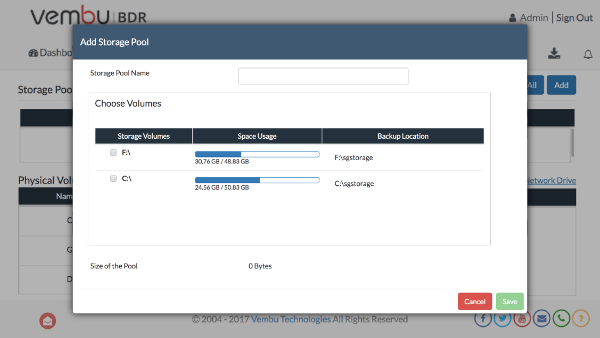 It will also support addition of different storage media such as Local drives, NAS(NFS and CIFS) and SAN(iSCSI and FC) to the same backup server any time as your storage repository needs to be scaled up. Users can also aggregate the space available from different volumes and utilise them to store backups. If you need technical assistance during evaluation please provide your contact information below.